UltraCopy is a utility used to copy the contents of one storage media device to another, run either manually or as a scheduled a job. Backup Migration is another utility used to automate the UltraCopy process without having to schedule an UltraCopy job and to add more options to the backup migration process. Manage and monitor multiple device backup migrations. Skip backup migrations if a destination target device is busy, until the device is available. Configure alternate destination target devices if the first device is busy. Set how long of a delay the backup job can take before the backup migration is removed from the queue. Set how many backup migration jobs run at once. Set how many times a backup migration job can fail before it is removed from the queue. Automatically after a Scheduled Backup Job finishes. 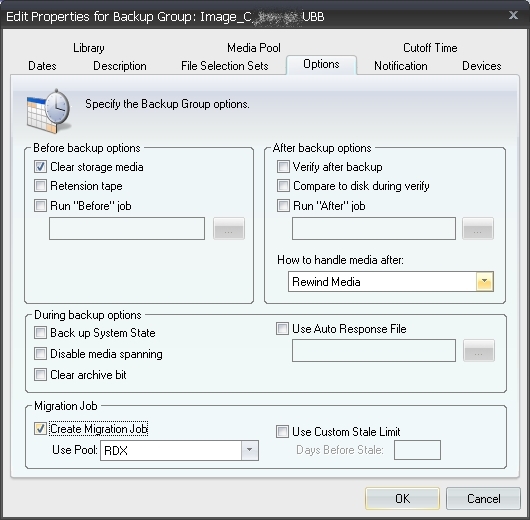 The settings for configuring are found on the Options tab in the "Backup Group Properties" of the Scheduled Backup Job. Automatically after an ad hoc (single) Backup Job. 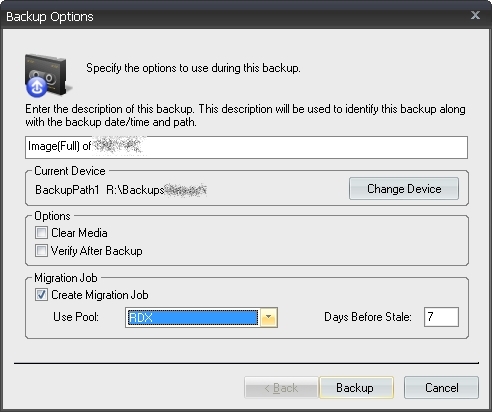 The Backup Migration option will be appear in a dialog box after you select the files to backup. 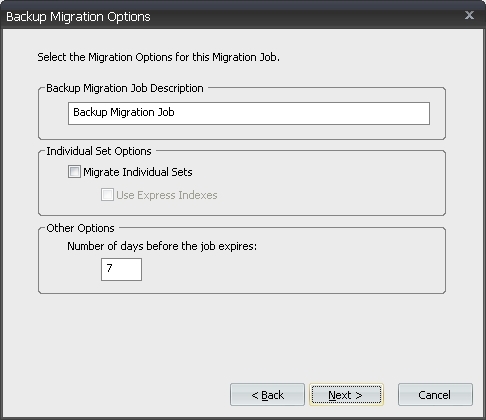 Manually add a job to the queue via the Backup Migration Queue User Interface. Backup Migration Jobs will be given a "Stale" number. This number will indicate how long a Migration Job will sit in the queue before it is removed. Scheduled Backup Jobs will have a stale number based on how often the Backup Job is scheduled. The stale number for manually created jobs can be entered by the user. The closer the stale date is, the higher priority that job will receive. Priority of Backup Migration Jobs is also determined by what devices are currently in use. If a device is in use, Migration will skip it, until the device is available, unless a fail-over device is defined. Fig. 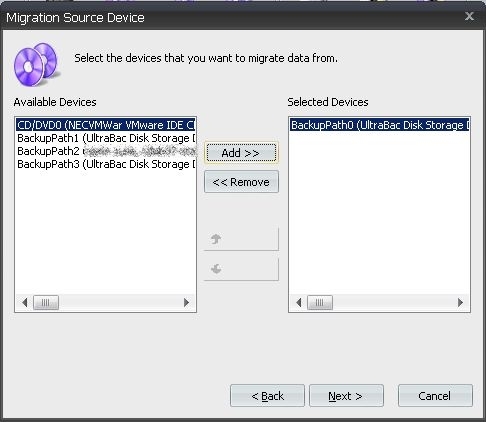 1 - Backup Migration options. The maximum number of times a Job can fail before being canceled – Allows the migration queue to cancel any job that has failed X amount of times preventing migration getting stuck in a loop. 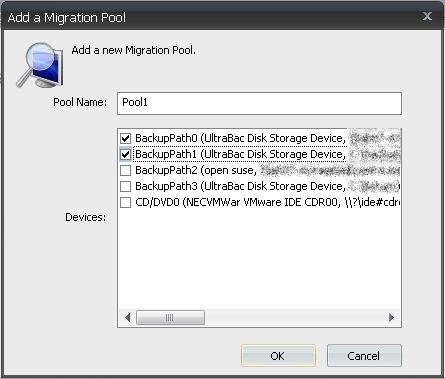 Select "Tools"/"Backup Migration"/"Add / Edit Migration pools." Fig. 2 - Backup Migration menu. Fig. 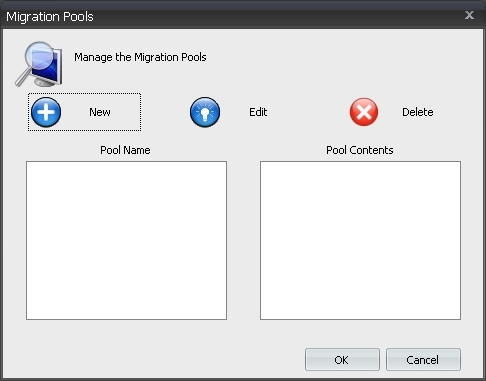 3 - Migration Pools. Type in the name you want to call the migration pool, select the devices you want added to the migration pool automatically, and click the “OK” button. Fig. 4 - Add a migration pool. Select "Tools"/"Backup Migration"/"Add Backup Migration Job." Fig. 5 - Backup Migration menu. Choose an available source device and click "Add >>" to add the device as a selected source device. Click "Next." Fig. 6 - Migration source device. 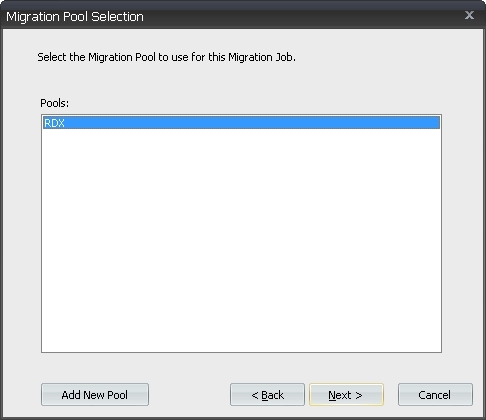 Select the Migration pool you want to use, or create a new migration pool (see section on Creating Migration Pools), and click "Next." Fig. 7 - Migration pool selection. 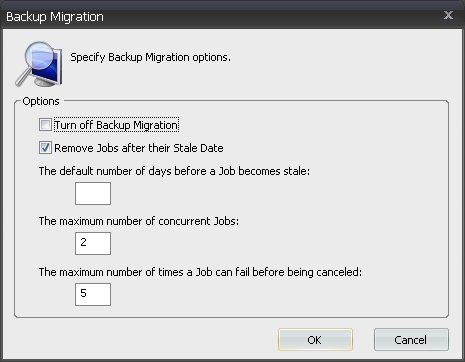 Select the Backup Migration Options for the job and click "Next." Fig. 8 - Backup migration options. Backup Migration Job Description – give the job a description name. Migrate Individual Sets – allows you to select specific backups to migrate. Use Express Index – saves time when loading sets from tape media. Other Options – define the number of days a job can sit idle before the job expires and is deleted from the queue. 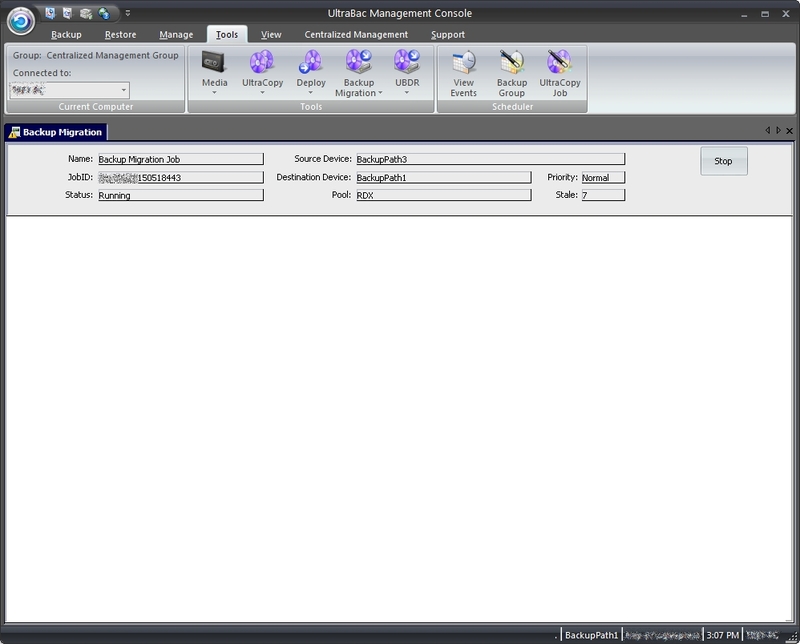 A summary screen of your Backup Migration Job configuration will appear. Click "Migrate" to schedule the backup migration job in the backup migration queue. Fig. 9 - Backup migration summary. Create a backup set of any agent. In the Backup window, from the menu bar select "Action"/"Run backup now" and you will see the Backup Options including the options for "Migration Job." Choose the migration pool that will be used for this migration job and the days before the migration job becomes stale. Fig. 10 - Ad hoc backup job migration options. Create a new scheduled job, or modify an existing scheduled job. From the Properties window of the scheduled job, select the Options tab. 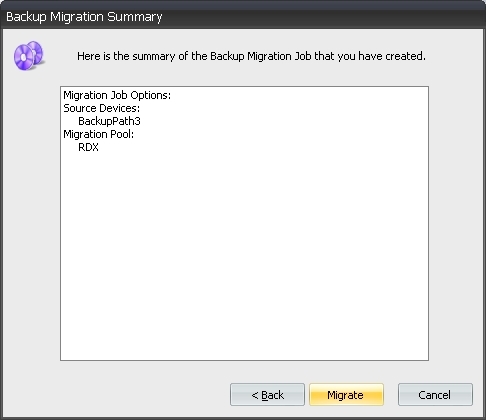 On the Options tab, you will see the Backup Options including the options for "Migration Job." Fig. 11 - Schedule backup job migration options. To view the Migration Jobs in the Migration Queue, select "View" from the menu bar, and then select "Reports"/"View Migration Queue." All of the backup migration jobs will appear in the Migration Queue. Fig. 12 - Backup Migration Queue.